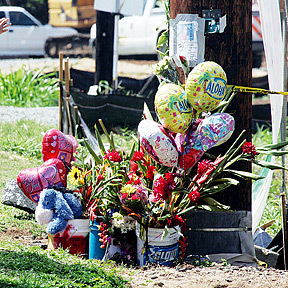 MEMORIAL GROWS: A roadside memorial grows near the site of two crashes that killed four teens last weekend. The Onishis are still trying to compel the city to act to prevent a similar tragedy. Kahuku students make posters and reminisce about the youths killed in 2 crashes. School-by-school scores on the state's key standardized test were released yesterday by the state Department of Education. Bishop Museum publishes a collection of historic surfing photos. Allen-Jones and Kafentzis remain in the picture with Hawaii's opener looming. Despite progress, Local 5 will go on with a strike authorization vote. The Oahu Burial Council delays a public meeting until next month. Four teenagers were killed in two car accidents at the same spot along the North Shore's Kamehameha Highway.